100 Days of Learning... Laughing... and loving!! One year instead of doing individual 100th day projects... we did group projects at school. We would NOT want 100 boo-boos... but it sure was fun putting all those band-aids on!!! All kids LOVE band-aids!! What girl wouldn't want 100 flowers!!!! We would not want 100 Chicken pox!! We would want 100 kisses!!! The questions on the glyph are a little different. We did this one year when we had white Christmas. Students brought in photos of their snowmen they made over the holidays to add to the display!! They are super cute and fun!!!! Thanks for sharing your photos Jenn!!! Penguins, penguins everywhere!! I absolutely love these darling little creatures, don't you? I know my first graders do, too. There is so much to learn about them and it's so easy to incorporate all subject areas. Wow at the resources available out there! I started with an anchor chart called "What Do You Think?" The kids responded to 3 questions by writing a simple YES or NO: Can penguins fly? Do penguins have feathers? and Do penguins live at the North Pole? Next, I introduced students to the wonderful author, Helen Lester, who wrote the Tacky series. We are going to read lots of fictional books about penguins as well as non-fiction so we can contrast the difference between the two types of books. I found an awesome link of someone reading the first Tacky book online that is perfect for showing on the Smartboard if you have one. Then of course we created our Glyph Girls' Penguin Glyphs to hurry and get something up on that post holiday empty bulletin board out in the hall. I love these little critters because with the little red hearts on them I can leave them up until after Valentine's Day if I want to! Click here to go to our Teachers Pay Teachers store and purchase the Little Penguin Glyph with Writing Options! Here's a short and sweet freebie for you that I made for my Word Work Station. 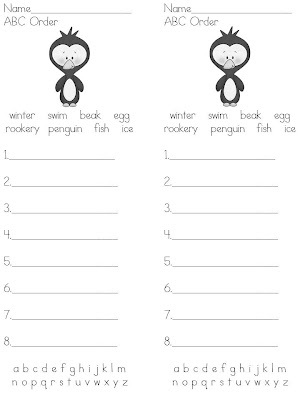 It's an ABC order worksheet with a Penguin Theme. Click on the pic to download. We also learned this super fun Jack Hartman penguin song that was perfect for some indoor recess activity. It looks a little cheesy, but I kid tested it and it was a BIG hit! More to come!